Algae growth is inevitable. When it comes to your tank, the trick is to keep it in check. You want to maintain algae that serves your aquarium environment but without it growing excessively, posing a risk to your fish and plants. This form of brown algae is common in new tank environments. It typically shows up by coating your tank in sheets that can be wiped off. It is harmless and will disappear as soon as your tank acclimates. This bluish-toned alage lookalike is actually not an algae at all. Instead it is a cyanobacteria that is attributed to water with excessive nitrates or phosphates. This green form of algae is pretty common and is harmless as long as it does not overrun your tank. One of the more stubborn forms of algae, this red form often appears on plants. To rid your tank of this algae, use a weak bleach solution. 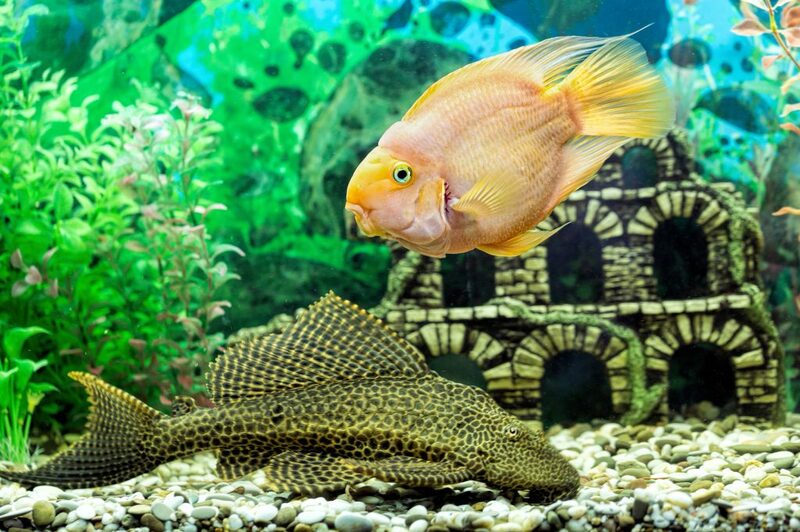 To avoid algae overgrowth, reduce the lighting in your tank and be sure to move away from any direct sunlight. You may also want to reconsider the amount of food that your feed your fish as excess food in water can increase the phosphate levels. At Hikari, we also recommend changing ten to fifteen percent of your tank’s water every week in addition to testing your water source to watch for phosphates and nitrates. Last but not least, supply your tank with algae eating plants and fish to reduce nutrients and counter algae overgrowth.